Oregon has 27 peaks with at least 25 miles of topographic isolation. Each of these peaks are at least 25 miles from any other peak having higher elevation. Topographic isolation is another way, beyond highest elevation and most topographic prominence, to identify potentially interesting peaks to visit. In August I visited two Oregon Isolation Peaks. I enjoyed exploring parts of Oregon I had never before seen, though the visibility was poor due to wildfire smoke. 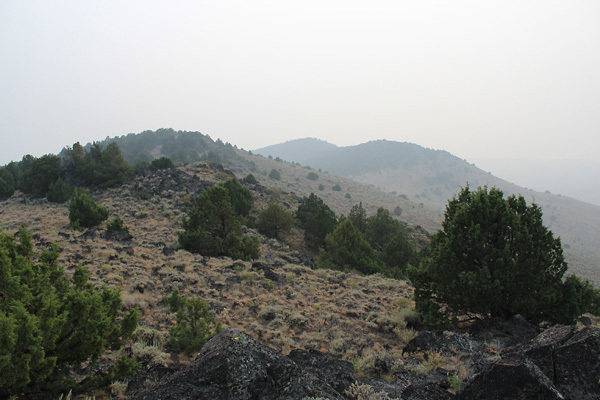 On Tuesday August 21 I visited Juniper Mountain east of US Highway 395 between Lakeview and Burns in southeast Oregon. Juniper Mountain lies in the Bureau of Land Management’s Lakeview District and is bisected by the Lake and Harney County Lines. 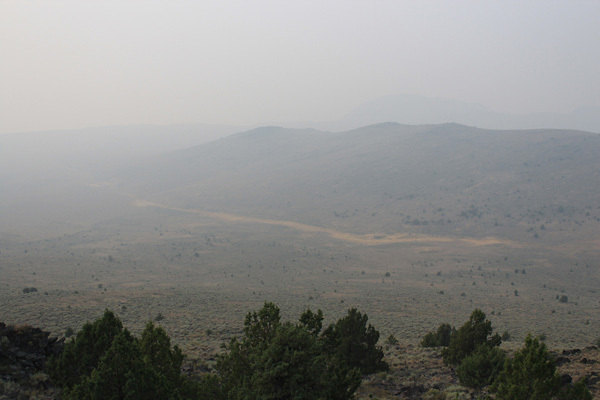 It is accessible by driving rangeland roads east of US 395. Good tires are reassuring on these sometimes rocky roads. Juniper Mountain has only 6679 feet of elevation and 1441 feet of clean topographic prominence, but does have 25.7 miles of topographic isolation. 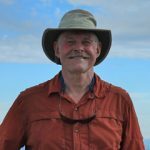 Its nearest higher “neighbor” in the peakbagger.com peak database is 25.7 miles away, an unnamed peak above Lake Abert with 6768 feet of elevation. I had never been near Juniper Mountain before and its isolation invited me to visit it. 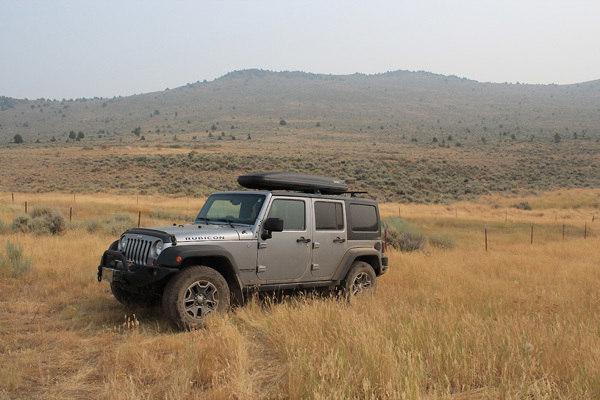 Fortunately I had access information from peakbagger.com and that combined with USGS topo maps and my capable and reliable Jeep got me to Horseshoe Spring below the summit of Juniper Mountain. The road continued on to the summit but was signed as closed to vehicles beyond Horseshoe Spring so I parked there and hiked 4 miles and 1000 feet elevation gain to the summit and back. Horseshoe Spring below from the summit of Juniper Mountain. Grays Butte is barely visible in the distance. It was a very smoky day and the views were disappointing, but I did get to visit an isolation peak and part of Oregon I had never before seen. I spent a quiet night camped off one of the rangeland roads. 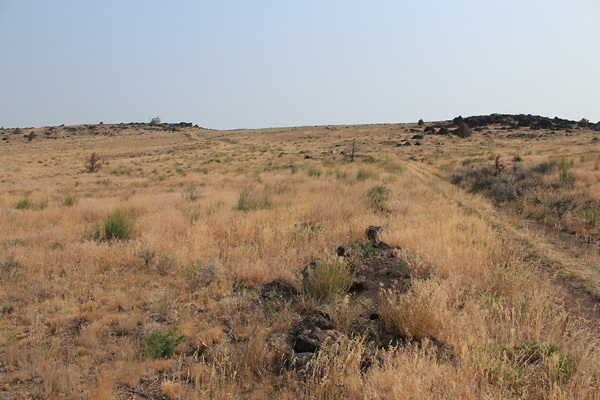 The next day, Wednesday August 22, I visited Wagontire Mountain southwest of Burns, Oregon. 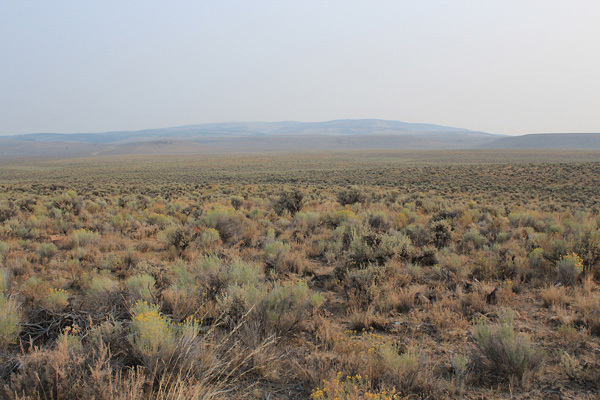 Wagontire Mountain lies in the Bureau of Land Management’s Lakeview District on the western boundary of Harney County. It is accessible by driving rangeland roads west of US Highway 395. Wagontire Mountain has 6513 feet of elevation and 1778 feet of clean topographic prominence, making it the 106th most prominent peak in Oregon. Wagontire Mountain also has 28.7 miles of topographic isolation. Its nearest higher “neighbor” in the peakbagger.com peak database is 28.7 miles away, in this case Juniper Mountain which I visited the day before. I had never been near Wagontire Mountain before either. Access information from peakbagger.com combined with USGS topo maps and my Jeep navigation system got me to the expected locked gate on the south slopes of Wagontire Mountain. I parked there and hiked 6 miles and 1000 feet elevation gain to the summit lookout and back. The WAGONTIRE Benchmark and summit registry were well marked. Ladybugs sheltered under rocks covering the benchmark and summit registry. I replaced the rocks before I left. The views were partially obscured by smoke but it was a pleasant, solitary hike to a rarely visited peak and another part of Oregon I had never before seen. This hike completed my project of visiting all 27 Oregon peaks with at least 25 miles of isolation. I have so many other peak lists to work on! 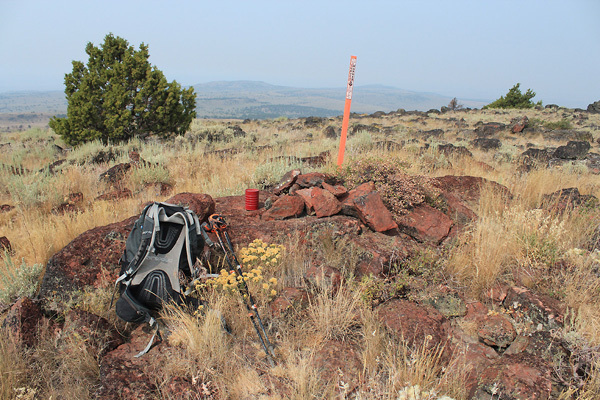 This entry was posted in Hiking and tagged Isolation, Juniper Mountain, Oregon, Wagontire Mountain. Bookmark the permalink.